Whether you have 50 or 1,500 guests we can cater for your celebration! Courteous, professional DJ’s with state of the art equipment- book today! The professional approach of Nigel F Mobile Discos sets us apart from the usual. We listen to your needs and tailor the show to suit you. It’s your party and you can have as much or as little input into the music selection as you would like! Wherever possible we will set up earlier in the day of the function so your day runs smoothly and all is set ready for in good time for your celebration! All equipment is the latest in lighting styles & sound quality AND is PAT Certified. Full Public Liability Insurance is also in place. Please bear in mind we will rarely be the cheapest DJ/Disco you will find and there is a very good reason for that. You are booking with a recommended, reputable and reliable DJ/Disco/Event company whereby client enjoyment and satisfaction is always the first priority in all we do. We always have reserve DJ’s and equipment in place to cover any last minute emergency. All bookings are backed up with written confirmations and a great amount of time goes into the planning, preparation and performance for your Event. What areas do we cover? : The North West, Yorkshire including Sheffield, Leeds, Barnsley, Rotherham & Doncaster, Nottinghamshire, Mansfield, Chesterfield, Burton & Loughborough & Derby amongst others- make your query today! All our DJ’s undergo a thorough training programme. This not only gives them a solid grounding in the art of DJ’ing but gives a perspective as to what clients expect of a DJ. All our DJ’s are capable of playing a vast range of music from strict tempo ballroom dancing, rock n roll, soul n motown, party music, dance music, current chart music, RnB, 60s, 70s, 80s, 90s and 00s. Our DJ’s are equally at home playing at a black tie function, performing at a wedding in glamorous surroundings or at a more casual pub disco. Nigel F Mobile Discos has between 15 and 20 DJ’s to choose from and they are all different whether by age, gender, genre of music, personality or karaoke so we will always provide the right DJ for your occasion. So we can cater from childrens/teen/prom/student balls/18th/21st celebrations through to weddings/corporate/charity/any age birthday/celebrations and specialist music occasions/christmas/new year parties or any other party/celebration/event……no matter the occasion we have the DJ for you. Choose your Mobile Disco setup from the amazing options below! Suitable for events for between 20 to 60 guests. 500 watts sound. Suitable for events for between 20-120 guests. 1k sound. Suitable for events for between 100 to 400 guests. 2k sound. 4.5 metres space required. Starcloth backdrop provided as an optional extra. Suitable for events for between 200 to 800 guests. 4k sound. Suitable for events for between 200 and 1500 guests. 10k watts sound and spectacular lighting for the ‘Wow Factor’. Space required to be discussed at time of booking. The Ultimate in Discotheque Entertainment, the awesome Mega Show is really a mobile nightclub. 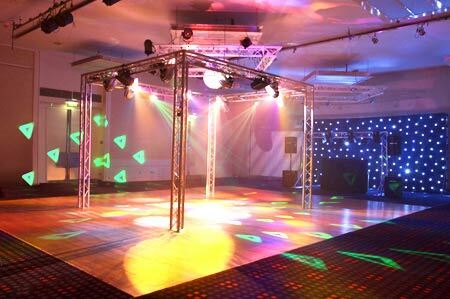 A free-standing over dance floor lighting rig with between 12 & 16 intelligent effects and lasers with a Vegas Style LED backdrop. The show features a 10K Court Acoustics Ramjet Sound System described by Keith Hardy of Ministry of Sound as ‘quite simply breathtaking’. Yes, on your special evening to celebrate your Wedding, why not have your names and special Wedding date in a heart lit up on the dance floor for all your guests to see!! Want a fabulous wash of colour lending a radiant ambience across your venue? Add some Uplighters! Uplighters are fantastic for adding a colouring and effect to any event so if you want to impress your guests and contrast or supplement your colour theme then book some today! They can be set at a static colour to suit your taste or scroll through a colour changing pattern. These will create a fabulous ‘ Grand Entrance’ to your party. They can be set at a flame colour effect or scroll through a colour changing pattern. They can also be located to the side of a stage, band, DJ, special object to attract attention! To add as a stunning backdrop to a stage, behind the DJ, behind a Bar or even as a backdrop for your photographs. A range of different size Black with white LED’s are available. Whether its an award ceremony you are planning or you wish to light up a performer whilst they move around, then we have a powerful white spot light to do the job! Nigel F Mobile Discos are proven specialists in providing DJs, Discos and ‘Free’ Extras for Proms and Student Balls! Because we provide the right style and age of DJ who will fit in to your celebration. The music played will be the latest in chart, new releases, RnB, dance, indie with classic party and floorfillers a must too! We will take a play list in advance and of course requests can be made to the DJ on the evening. We will provide the latest in night club style lighting and lazer light shows. We will provide two silk flames FREE of charge at the doorway to your function to create a grand entrance and pzazz. We will provide radio microphone facilities FREE of charge for any speeches or presentations.